If you have ever ridden on a roller coaster you will know that you feel the greatest force at the lowest point of the ride. This is where the downward force of your weight is augmented by the downward centrifugal force you feel from your nearly circular motion around a roller coaster loop. Something similar happens in a spectacular gymnastic routine on the high bar. 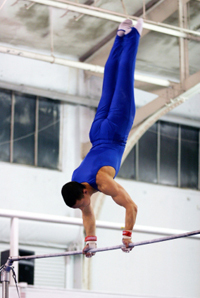 When a gymnast performs a Giant Swing on the high bar, he has to rotate in a full circle while holding the bar with arms held fully extended (here is a nice video from Drills and Skills). Only the men do this particular exercise in competition; women use the uneven parallel (sometimes called asymmetric) bars to perform a different range of movements. The straightforward movement of the Giant Swing requires great strength and skill to perform. The high bar is a 2.4 cm steel bar raised 2.5 m above the ground and leather grips are used on the hands to maintain a tight grasp of the bar. Allowing for all our simplifications and particular choices for and (notice that making ten per cent smaller brings the total force nearer to ) we should probably simply conclude that the total force will be somewhere between and : that is, an acceleration between and ! This stress is very severe, although the head of the gymnast is spinning in a circle with a smaller radius than and so feels feels smaller forces on the blood vessels supplying the brain and on the retinas of the eyes. 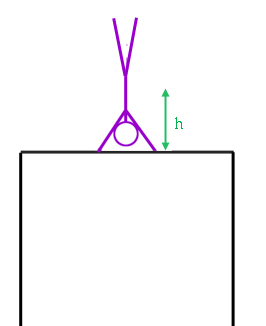 Notice that even if you start from a motionless vertical handstand you only reduce the total force by about one . Interestingly, the force that a rider would feel at the bottom of a circular roller coaster ride is also about . To avoid such dangerous stresses roller coaster tracks are not circular. Our simple calculation reveals the extraordinary strength needed to perform even the most basic gymnastic exercise. Don’t try this at home!